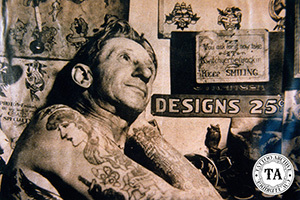 Tattooing and sign painting are two occupations that have been tied together for many years. Doc Webb was a show card painter before he started tattooing and Bob Wicks became a show front painter after leaving tattooing. Wall space in a tattoo shop might as well be gold because every available square inch of space, including the ceilings, are covered with designs. Shop owners will try to have something for anyone and everyone who walks through their doors. Today flash wall racks are seen in more and more shops as owners try to increase their design selection. Although shop wall space is at a premium, a bit of it is always reserved for informational signage. This would include the age required to get a tattoo, the minimum price of a tattoo and the shop hours. Then there would be the signs of what is not allowed, as in no drinking, no smoking, no children and no food. Often the length of this list depends on the number of bad experiences the tattooist has with the public. State and city laws sometimes require certain signs. In the 1970s, Danny Danzel had to have a "no spitting" sign posted in public view in his Seattle, Washington shop. He said that city law required it. 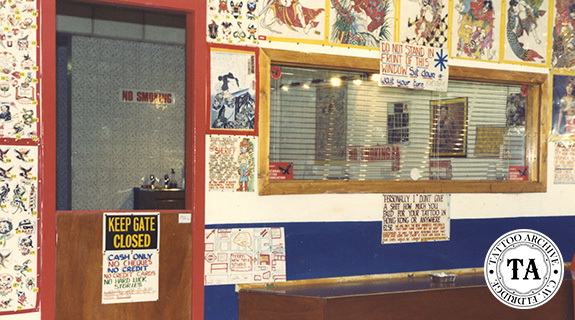 I must admit that before becoming a tattoo artist I would look at old-time photos of shop interiors and wonder if all those signs were actually necessary. 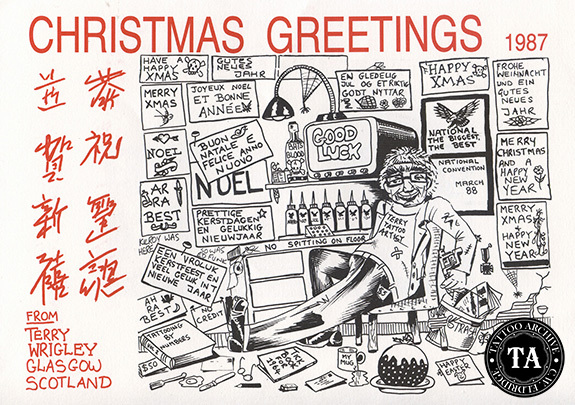 But when I became a tattooist, I began to understand their use. The "Do's and Don'ts signs, as I like to call them, offer an important service to the tattooist and the public, establishing a loose code of conduct for people coming into the shop. This often saves the tattooist time explaining various shop policies thus allowing customers to feel like they are being dealt with in an even-handed fashion. Custom signs are not limited to the inside of a tattoo shop. Many shops have very fancy signage on the outside as well. If a tattoo shop is located in an historical section of town and the city will not allow the building itself to be painted, the tattooist could have panels cut to fit the side of the building. The panels would be painted and bolted to the building, thus complying with city ordinances and doing very little damage to the original structure.